Ecuador has an avifauna diversity that is unparalleled throughout the world. Of the 3000 species of birds inhabiting the continent of South America, over half of those species can be encountered in this small and friendly nation. What makes birding in Ecuador even more appealing is that most of these birds are easily accessible by public transportation. It is the goal of this blog to highlight the avian beauty of this country through photographic images and in-depth descriptions. 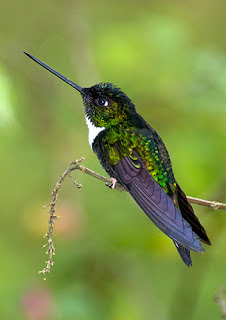 The Collared Inca is a colorful hummingbird of the Andes highlands, inhabiting the mountain forests of the tropical rainforest from 2,100 – 3000 m (7,000 – 10,000 ft). Ranging from western Venezuela down into central Peru and western Bolivia, it never ventures into the Páramo, keeping to the protective confines of the trees. Within Ecuador there are two similar races, the torquata of the eastern slope and the fulgidigula of the west. The western variety can be observed from the Columbian border south to Chimborazo, although it has not been witnessed as frequently below Cotopaxi in recent years. The torquata can be encountered along the full extent of the Andes on the eastern slope within the borders of Ecuador. The Inca on the western slope is predominantly black on its upper parts, transforming to a brilliant dark green at the rump. There is a small luminous blue patch on the top of the head, although not always obvious in the field. In addition to a white spot behind the eye, it will have a sizable and conspicuous white breastplate. The throat will be glittering green and the lower section black with a green luster. The tail feathers are white with black tips contrasting with greenish-black central quills. The female on both slopes will be similar is pattern although not as flamboyant. The Collared Inca measures 11 cm (4 ½ in) in length with a long, straight bill of 33 mm (1.3 in). On the eastern slope the Collared Inca will vary in that the crown patch will appear in a gleaming violet hue. The lower parts will be much darker than its western cousin, as will the throat. In all other aspects they are quite similar. Birds from Carchi, above Maldonado, appear to combine features of both nominate. 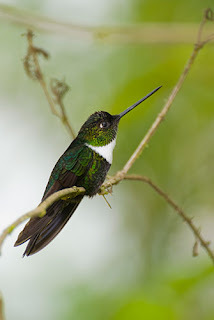 Regardless of their location, there are no similar species within Ecuador that combine the conspicuous white chest patch with the white tail feathers. This outstanding hummingbird of the upper-elevations woodlands is fairly common and noticeable as it gathers nectar from the abundant flora of the rainforest. It can be observed in open areas near sparsely populated villages and will ignore intruders if they are patient and cautious not to disturb the environment. This is a wonderful blog, so interesting for anyone who loves birds and travel. Thank you so much. Grew up in Cincinnati, Ohio. After joining the Air Force in 1967, traveled throughout the US and other parts of the world. Moved to Quito, Ecuador in 2000. Spend most of my days traveling throughout the country and photographing birds.